This program is read by the author, Heather Cabot. Meet the women who haven't asked for permission from Silicon Valley to chase their dreams. They are going for it -- building the next generation of tech start-ups, investing in each other's ventures, crushing male hacker stereotypes and rallying the next generation of women in tech. 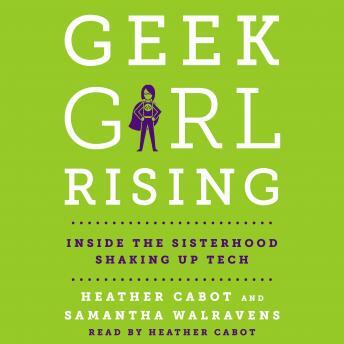 Geek Girl Rising isn't about the famous tech trailblazers you already know, like Sheryl Sandberg and Marissa Mayer. Instead, veteran journalists Heather Cabot and Samantha Walravens introduce listeners to the fearless female entrepreneurs and technologists fighting at the grassroots level for an ownership stake in the revolution that's changing the way we live, work and connect to each other. Listeners will meet Debbie Sterling, inventor of GoldieBlox, the first engineering toy for girls, which topples the notion that only boys can build. They'll get a peek inside YouTube sensation Michelle Phan's ipsy studios, where she is grooming the next generation of digital video stars while leading her own mega e-commerce beauty business. They will sit down with Tracy Chou, former lead software developer at Pinterest, whose public urging in 2013 helped push Silicon Valley tech giants to reveal the tiny number of women in their ranks, propelling the "women in tech" conversation to front pages. They will tour the headquarters of The Muse, the hottest career site for millennials and meet its intrepid CEO, Kathryn Minshew, who stared down sexism while raising millions of dollars to fund the company she co-founded. And they will journey around the country to meet a new crop of female investors, including Theresia Gouw and Kathryn Finney, who are infusing women-led tech start-ups with much needed capital.